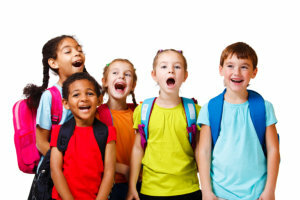 We offer a Summer Program June through August each year. Our summer program is still executed using the Montessori Method, but the focus changes each year. For Summer 2017, our focus was “A Trip Around the World”. The program consisted of “visits” to various landmarks in countries around the world and included lessons on packing a suitcase, traveling using various modes of transportation, making and tasting foods from each country, and creating souvenirs along the way. Similarly, we have planned “A Great American Getaway” for Summer 2018, in which we will visit various U.S. tourist attractions. We invite you to visit our Facebook page for updates on our travels throughout the summer each year! Additionally, we host water play activities every Friday throughout the summer. 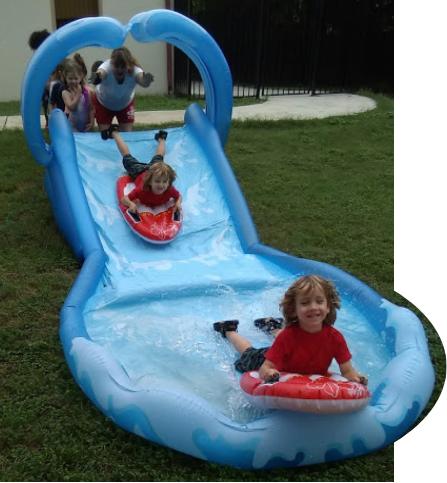 We have several water slides, wading pools, sprinklers, and a water table for some really cool fun in the sun!